-What is the intent of the optional LP designation? -How is the testing performed and who does it? -Will LP be included in the 2017 NEC ? 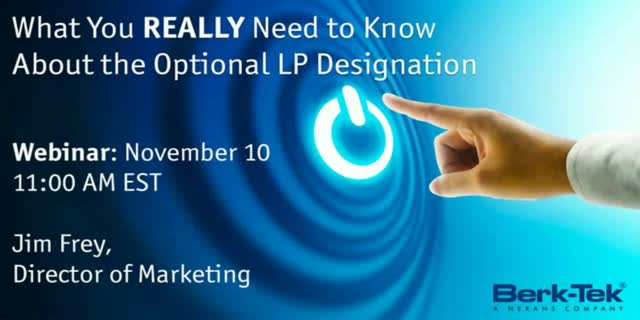 -What does the optional LP designation actually mean? AV technologies are advancing rapidly, and the amount of video traffic crossing IP networks is growing at a rate of 25% every year. By 2021, it’s expected that one million minutes of video traffic will cross global IP networks every single second. With that kind of demand, it’s more important than ever to install an AV system that not only delivers flawless image quality with low latency but also delivers the scalability and flexibility needed to expand your system. Attend this webinar to learn best practices for enterprise AV systems. -How to select the right solution to avoid potential pitfalls. According to the Cisco VNI forecast, global IP traffic is expected to nearly triple between the years 2015 and 2020. Advancements in wireless and A/V technologies are also driving up the demand for bandwidth. As buildings become more connected and more intelligent, the amount of data flowing through your network will continue to increase exponentially. Installing Cat 6A solves the bandwidth challenge in the horizontal. But what about the fiber backbone that needs to support all of those additional 10Gbps drops? And how about wireless access points or security cameras that you need to connect and power out in the parking garage that far exceed the 100 meter distance limitation? This 30-minute webinar will present several solutions for maintaining the reach you need for maximum performance while supporting an ever-increasing amount of bandwidth over your network. At Berk-Tek, we put the customer at the heart of everything we do. This statement stands true in the TEK Center’s research and development labs. A network is only as strong as the cables used to connect it and the applications lab works to ensure that every Berk-Tek cable performs beyond your expectations. By employing industry-leading research, advanced testing procedures and sophisticated modeling for emerging technologies, the applications lab translates expanding network requirements into leading edge cabling solutions that perform beyond the standard. Corporations across all industries face the challenge of taking power and data to new distances while meeting higher bandwidth demand. Frequently combined with this challenge is the requirement to provide local power in excess of 100 meters for remote IP-based devices, such as security cameras, wireless access points, emergency blue-light phones and card readers. Learn how OneReach™, a Berk-Tek PoE extender system, combines optical fiber for long-distance gigabit transmission and copper conductors in a single system. The TEK Center at Berk-Tek is a premier showcase for emerging technologies in enterprise environments. With the growing number of devices that will be connected and powered via power over Ethernet, enterprise networks need to be prepared for increased demand now and in the future. Wireless, video, security and building automation can put major stress on networks in the office, campus, security and medical environments. As the internet of everything continues to evolve, your network will be asked to support a multitude of diverse applications. The TEK Center’s expertise in systems standards, networking technologies and emerging applications can help address your network demands. Explosive growth in the number of wireless devices being used, combined with advancing wireless technology, will eventually lead to big changes to your network infrastructure. This 30-minute webinar will review the evolution of network technology and the associated bandwidth requirements of each new generation. It will also discuss how next generation WAPs (only a few years away) will affect your horizontal network infrastructure, and eventually, your fiber backbone too. The webinar will close with some recommended network infrastructure solutions you should consider for your next WiFi project. “Own the Link” is a revolutionary approach to specifying the transceivers used in data links. Since its launch in 2016, new tools and products have been added to the program, delivering more benefits than ever before. This short webinar will demonstrate how Own the Link can help you maximize your network, and we’ll look towards the future with a peek at what tomorrow might bring. * The first 100 people to pre-register for this webinar will receive a $5 Starbucks gift card via email on 3/29. There is a transition happening in our industry right before our eyes. Essentially, 1Gbps drops to the wall outlets are being replaced by 10Gbps drops to the ceiling. This is because, as 802.11ac technology advances and A/V applications like HDBaseT come onto the scene, enterprises are requiring more and more Category 6A connections to handle bandwidth demand to devices. But what happens beyond the devices? Your network, like a chain, it is only as strong as its weakest link. - Show you how this transition from 1Gbps to 10Gbps is creating a problem you may not know you have. - Explain the “Forgotten Link” and how this 10X transition is already starting to overwhelm it. - Introduce an engineered solution from Berk-Tek that will solve this emerging problem. PLUS earn one CEC for attending. High Definition Video is prevalent in our everyday lives. From the board room to the classroom, the sports bar to the sports stadium, the demand for dynamic audio-visual content is rapidly increasing. Traditional methods of transporting content to displays are a thing of the past. This presentation explores technologies and methods for connecting A/V sources to HD displays using twisted pair cabling and provides guidance for successful deployment. Technology is ever-changing and you need to prepare your data center for faster data rates. Berk-Tek can help you make your migration to future data rates easier and as cost effective as possible. Attend this webinar to learn how. Ever-increasing bandwidth demand is driving changes to your network and data center. Rest assured that in the coming years, you will need more servers, more switches, and more storage capacity connected at higher data rates. Using Berk-Tek’s 40Gbps transceivers paired with our GIGAlite™-10XB glass, we guarantee enough power budget to support a link distance of up to 500 meters. Watch this video learn more about how Berk-Tek can help you maximize your power budget. Cellular wireless traffic continues along a five-fold expected growth pattern over the next 5 years. In 2015, more than 50% was offloaded onto a wireless network and the percentage is expected to increase to 55% by 2020. How will this growth impact future wireless deployments and what is the industry doing to enable the future demand? This presentation will answer those questions and explain how system owners can stay ahead of the wave. These monthly live webcasts are aimed at explaining how emerging technologies will impact the network infrastructures currently in place and under development. We are focused on preparing you to create the resilient network that enables organizations to achieve a maximum usable network lifespan by providing insight into relevant standards and technologies.